[JB note – I type this sitting under the Sound Dome in ‘Lilla Salen’, one of the Royal College’s lecture theatres. 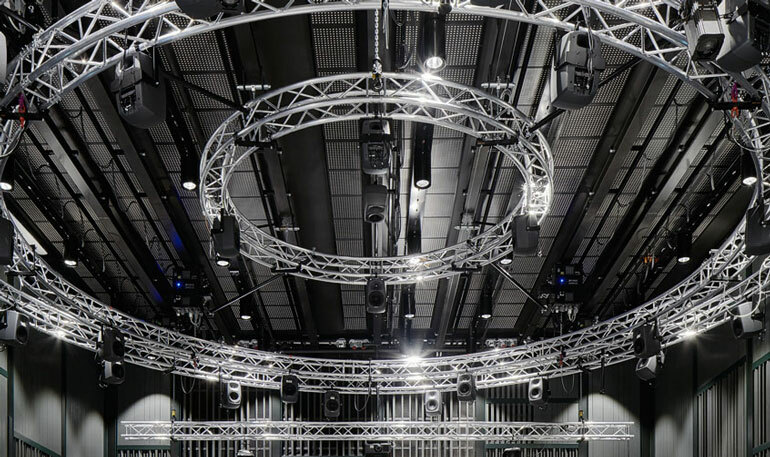 It appears to be an array of 13, 8 and 4 speakers arranged in concentric circles above a non-raked 100-ish seater auditorium in a large black box space, with options additional floor-level speakers in a circle. We can also see a big stereo FOH ceiling PA and four subs in the corners of the space. I’m sure we’ll hear more – in both senses of the phrase – soon].